Written by CMOS Bulletin SCMO on December 4, 2017 . Posted in Other, Weather, What's Current. For fans of the television series Law and Order, “Weather in the Courtroom” is the weather book for you. Start with a weather-related crime (or accident), follow it with the gathering of evidence, a jury trial – often with combative lawyers and breath-holding evidence, and then wrap it all up with a verdict. Add in the twist that the gumshoe detective collecting evidence isn’t a brash badge-wearing Sergeant Friday, but instead a conscientious details-oriented meteorologist, often helicoptering into the scene months later, sniffing the wind and then tunnelling through tomes of weather data. All together you get a very different take on classic courtroom drama. Here the weather is brought inside and put on the stand. The 96 year old author – whose meteorological career stretches back to World War Two – picks a wide variety of cases covering his 26 years of practice after retirement from NOAA. To his credit he includes cases that didn’t always go his way (or rather the way his client would have preferred). Each chapter deals with an accident or crime associated with a different weather phenomena, starting with the 1972 loss of a light aircraft in Alaska carry two Congressmen – an investigation which brought the author into the business – and then covers everything from fog-induced road accidents to counting the number of tornadoes at a ski lodge (with Ted Fujita’s help). Two especially interesting chapters further help illustrate the scope of the author’s practice. Chapter 2 is titled “The Secret Test That Killed” and details biological warfare testing over San Francisco in the 1950’s. Chapter 13 is titled “Christmas Overboard” and deals with the loss of 388 shipping containers due to a North Pacific storm that overtook the container ship APL China in 1998, with more than $100 million in lawsuits filed. On a practical level, forget the idea of reading this as a How To Book on forensic weather. The cases span 1972 – 2001 so the content isn’t exactly recent. Further, it’s definitely written in the parlance of the US justice system, where general damages (pain and suffering) and punitive damages (a court assigned penalty) can be spectacularly large, and the courtroom environment tense and combative. 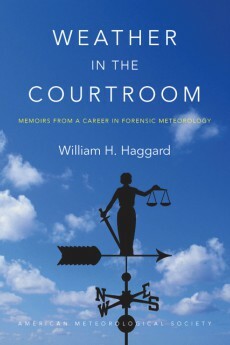 This is alluded to in the last case in the book – a 2001 murder investigation in North Carolina – where the author describes the defence attorney engaging in “a vigorous attack questioning my credentials…” and later a “belligerent and vigorous cross-examination.” Clearly forensic meteorology isn’t for shrinking violets. Overall this professionally written 15 chapter softcover is an easy read for any meteorologist, although the non-expert weather enthusiast might find the humidity of the prose a bit low (quite dry and technical in places). “Weather in the Courtroom” has an adequate number of author-produced illustrations (somewhat inconveniently grouped in the centre of the book) and the font, layout, use of white space plus reference section are all good.